Cloud backup and recovery is an affordable, secure and flexible solution that can fully protect all your data—including data that resides in remote offices and on mobile devices. But moving to cloud backup and choosing a service provider are big decisions that require a clear understanding of how your business will be impacted. Download this free guide to learn how cloud backup and recovery works—and why it could be a better solution for your business. 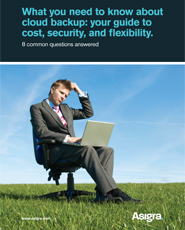 Included is all the information you need to make the decision to transition your backup and recovery tasks to the cloud, along with eight questions you need to ask when choosing a service provider. There are many factors that contribute to a successful transition to cloud backup and recovery. Get your free copy of this guide to find out what they are—and what you can do to avoid missteps.